For years, construction workers have relied on the services of steel toe safety boots to protect themselves while on a worksite. Despite having become a standard, manufacturers have developed a new material in recent years that is non-metallic to be used in safety toe boots. This non-metallic or ‘composite’ material may not be as tried-and-tested as the traditional steel tips, but it is gaining a following in the construction industry. To choose between the two, however, it is recommended that you look at the differences and decide which one suits your needs best. This article will provide specific information on the pros and cons of each design. As is mentioned above, steel toed boots have been are the standard safety measure for the heavy industry. The favorite of most workers www.seamar.com, the steel-toe boot gets its name from the fact that the toe-box is comprised of heavy-duty steel. Although it provides the best protection, they can be quite heavy, which is a disadvantage, and if you are not used to wearing them they can be rough on the feet. Of course, after wearing them for some time, the body will adapt and the skin will harden. But it does not come without discomfort. It should also be noted that steel-toed boots can retain heat and cold when working on extreme temperatures. They are also prone to set off metal detectors which can be a problem when moving to and from different locations. While the heaviness of the steel boot can be disadvantageous when you first wear them, the steel can also be very beneficial. By wearing this type of safety boots you are less likely to damage your toes in case anything heavy falls on your feet. Composite toe boots are considered a relatively new development in the work and safety footwear arena, but the brands who craft them are careful enough to abide to the same regulations traditional steel-toe boots are subject to. Composite material is a lot lighter than steel, so it provides a lot more mobility, and they go easy on your skin. There is also a lot less heat and cold retention and, of course, they never set off metal detectors. One issue that should be considered when looking at composite toe boots is that they are not as durable as steel-toe safety boots. Although the material offers great resistance, steel is still king. Besides, composite degrades over time, losing its toughness after a few years. It should also be noted that companies do not allow any reimbursement for composite toe boots regardless of the date of purchase. This is a significant concern because non-metallic boots are far more expensive than steel-toe safety boot options. 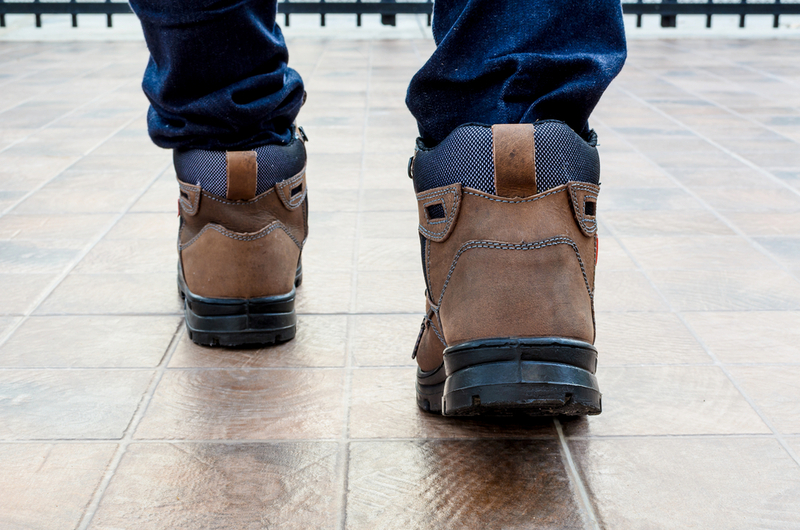 Both of these types of safety boots have their pros and cons, but one issue that is often misrepresented is that of electricity conductivity. Contrary to popular belief, steel toe boots do not conduct electricity. There is no difference regarding the safety of composite or steel-toe boots when it comes to dealing with electrical hazards. The primary difference between the two shoes is that steel-toe boots are stronger than the composite material. The actual work site should be taken into account when choosing between the two. Steel-toed boots are also more slender than composite boots, which makes them more appealing to the eyes. Safety toe construction boots are constantly evolving and there is no doubt that the trend is heading towards non-metallic gear. As innovation keeps its course, it is worthwhile looking at the pros and cons of both composite and steel-tipped boots.